Featuring the BBC NOW. Butterworth: Suite for String Quartet. Mathias: A Dance Overture. Ginastera: Harp Concerto. Britten: 4 Sea Interludes. Tchaikovsky: Symphony No 5. Katie Derham presents a week of performances from the BBC National Orchestra and Chorus of Wales. Today's selection features a concert given during the orchestra's recent tour of South America from Santiago, Chile, including Tchaikovsky's powerful 5th Symphony. The chorus sings a new BBC Radio 3 co-commission from Mark Bowden, the fruit of a trip to Patagonia he made following the steps of the Welsh settlers in Argentina. In this Proms Music Guide, Suzy Klein talks about Tchaikovsky's 5th Symphony. Charles Hazlewood explores the pieces Britten extracted from his opera. Performer: Catrin Finch. 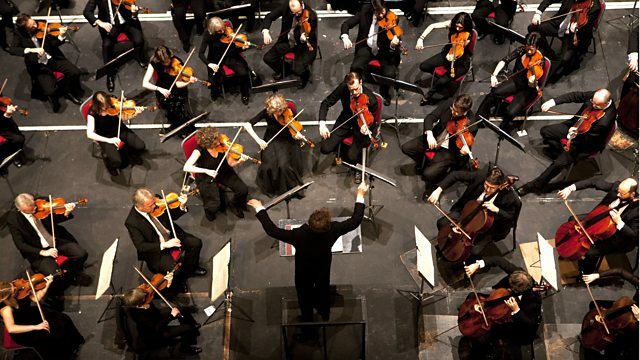 Orchestra: BBC National Orchestra of Wales. Conductor: Grant Llewellyn. Choir: BBC National Chorus of Wales. Conductor: Adrian Partington.